When we were discussing Oman, we went back and forward so many times over how we were going to get around. In the end we chose to rent a car for the first time in this trip. 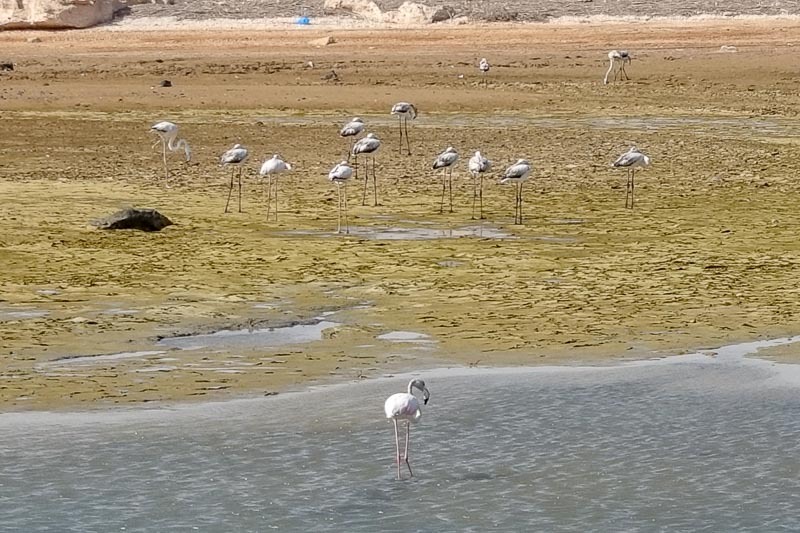 So our time in Oman ended up being one fantastic, long, road trip! We picked up our hire car from the Muscat airport on arrival. The airport is really not very big so it was easy to find the counter then go through all of the paperwork. We soon had the keys to a nice little Mazda 2 to get around in for the next ten days. Simon had chosen not to pay the extra to have me listed as an extra driver. I wasn’t sure if I was insulted that he didn’t want me to drive, or relieved! I also picked up a SIM card. We have just been using wifi since our last SIM card stopped working in Romania way back in July, but I thought it could be a good investment for navigation purposes. Again, there was a counter in arrivals and it was really easy to set up the SIM and we were soon on our way with Google Maps showing us the route. After not driving for months, and now driving on the wrong side of the road in a city we had never been to before, the first few minutes were tentative and nerve wracking. We were almost immediately on a highway with a speed limit of 120km/h, and the locals get very upset if you are not doing that speed, even in the slow lane. 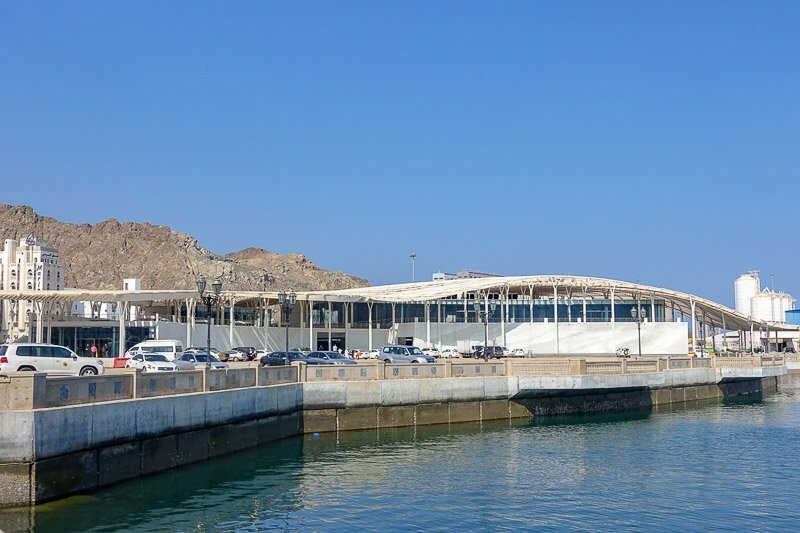 We had one full day to explore Muscat, but it started off a little slowly. 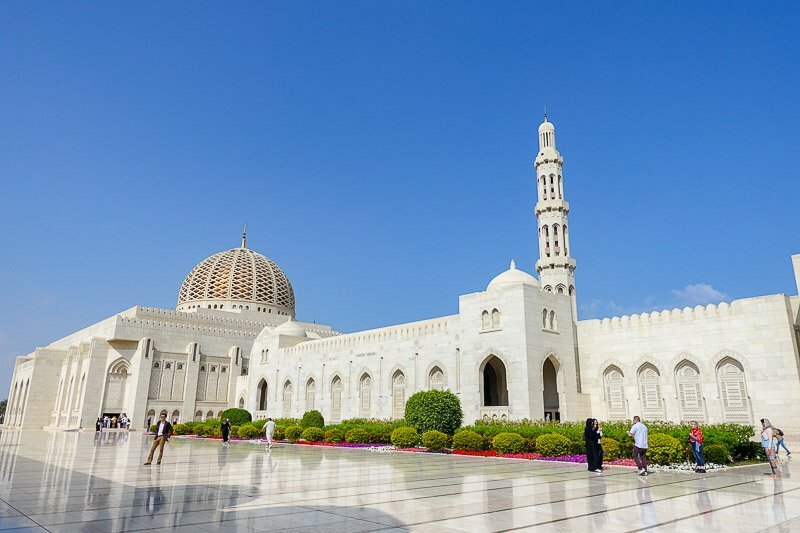 We were having a late breakfast and I was looking up the details for the Sultan Qaboos Grand Mosque which I wanted to visit and discovered it is only open to the public from 8:30 to 11am. We needed to get going! I was half expecting to be disappointed in this mosque after seeing the Sheikh Zayed Grand Mosque in Abu Dhabi only a few days before, but I was not. While overall it is not as flashy, there is still a wow factor here too. 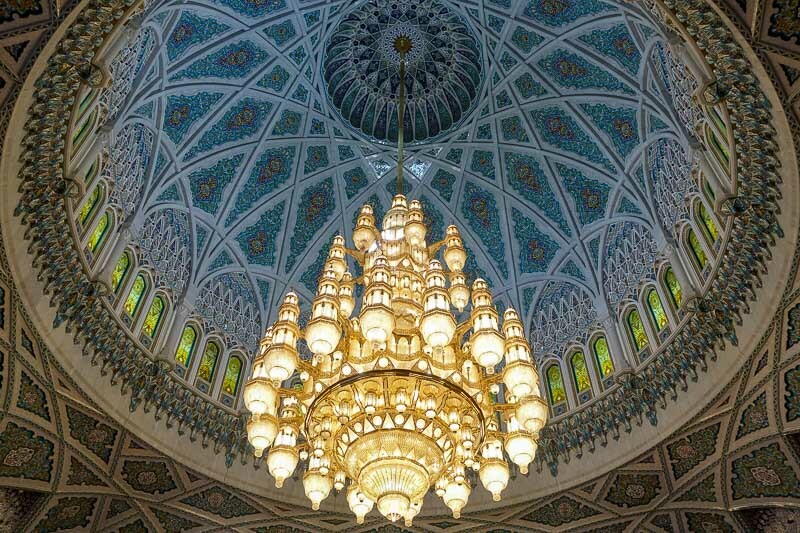 I actually liked the main chandelier inside more than the acclaimed one in Adu Dhabi. It really was stunning. 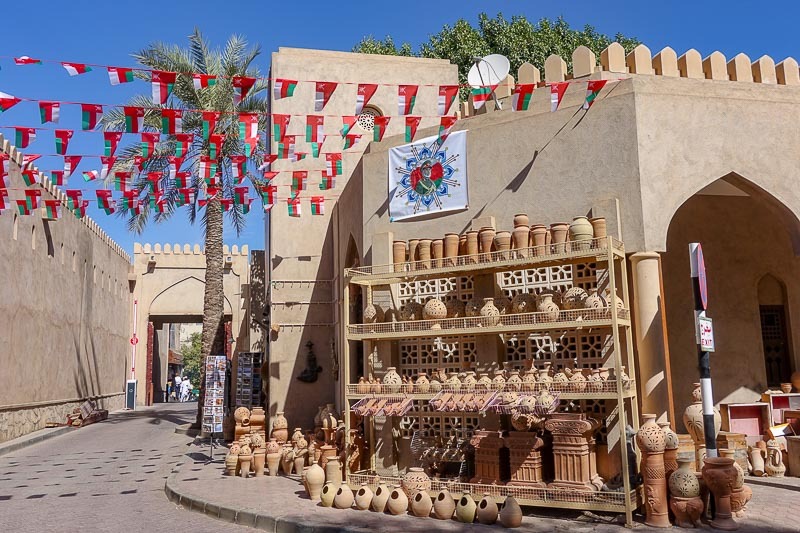 I also loved all the little alcoves outside showing off artwork from different Omani communities too. 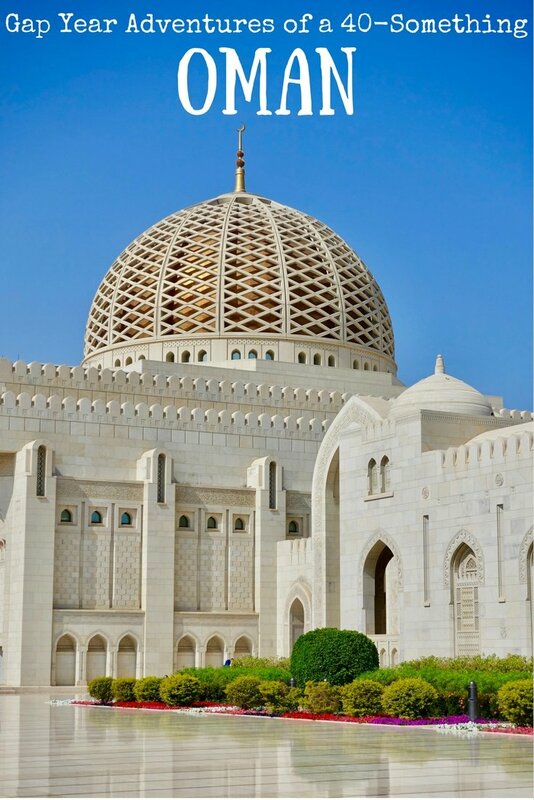 If you choose to visit the Sultan Qaboos Grand Mosque, make sure you dress appropriately. I didn’t see any options for borrowing clothing, and they really are quite strict on it. I was pulled up when my scarf slipped and some skin was showing between the neckline of my t-shirt (not at all low) and the scarf. I just had to drape it more carefully to ensure every bit of skin was covered. 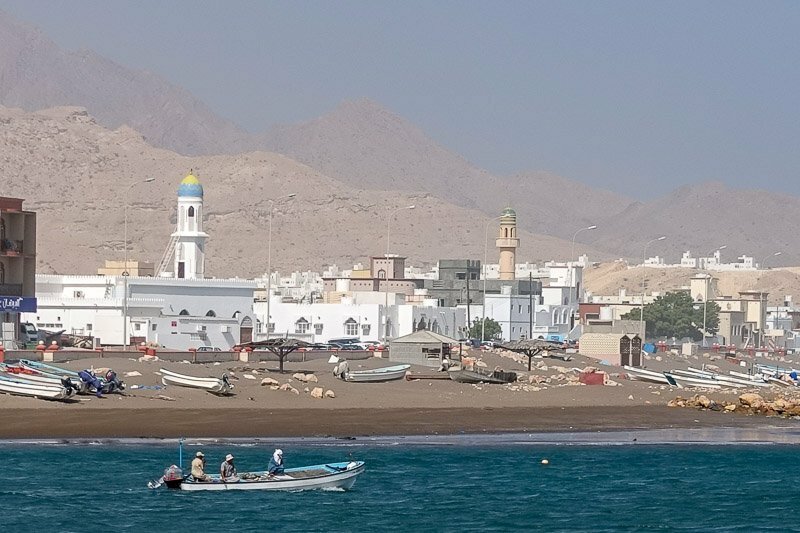 Our next stop was the coastal suburb of Mutrah. We went for a walk along the seafront, enjoying the slight relief from the heat allowed by the breeze. We were amazed at the amount and size of fish, crabs and other sealife we could see in the shallows as we leaned over the seawall. Right around to one side of the bay is a modern indoor market. One section is fresh foods and other bits and pieces, and another is a fish market. I tend to avoid fish markets because the smell is often overwhelming to me. We were late looking at this one though, so it was mostly packed up, and I was impressed by how clean it was. Walk back the other way and there is the famed Mutrah Souq. This place has been around for years and is what you imagine when you think of these sort of markets. 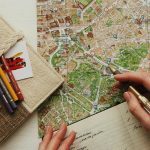 It has dark, narrow streets containing everything you could possibly imagine from spices to clothing to gold to household utensils. 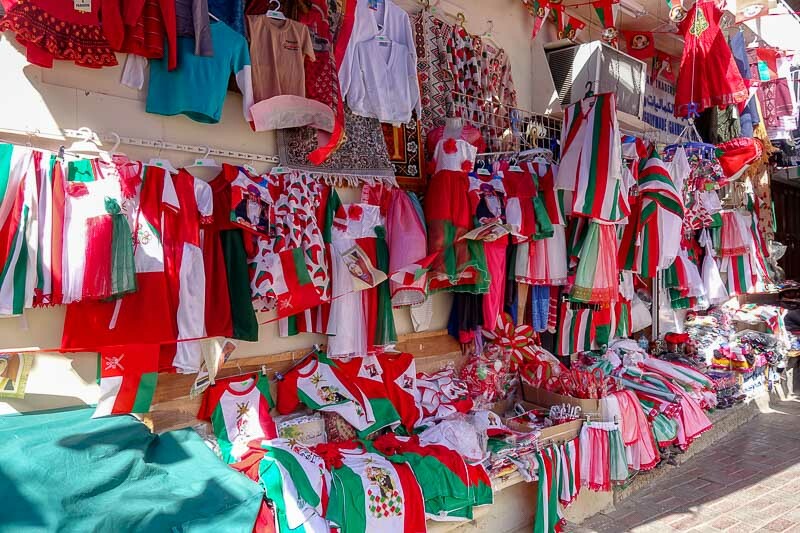 And since we were there right before their national day, red, green and white was everywhere. I originally thought it was Christmas decorations which did not make sense because many of the items were similar to what we would use to decorate for that. Down that end of the city is also the Al-Alam Palace, home of the current Sultan. It’s not open to visitors, but it is possible to stop outside the impressive front gates for a look. 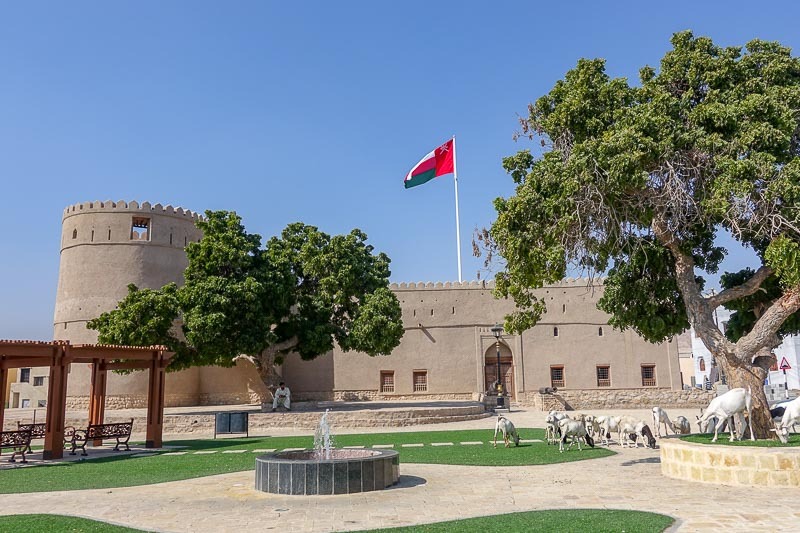 Nearby is also the National Museum of Oman. It has only been open about a year and it’s meant to be worth a visit, but we didn’t get there on this trip. We did discover that Australia isn’t the only place that has big “things”. From Mutrah we could see this big statue on top of the hill so we just had to go and have a look. Turned out to be a big incense burner. It was all closed up though so we couldn’t go and have a closer look, so not sure if it has a purpose or it is just there. We were still pretty nervous about the driving, and navigating on unfamiliar wrong-sided roads was, um, interesting. On the way back I took us the wrong way off one of the highways, and it was a big detour to try to get us back on the right road. But at least Simon was getting extra practice in the busy traffic of Muscat. The next morning our road trip began properly. This part of our trip was only loosely planned to allow for changes as we went. We had decided in the morning that our target for the day was to be the town of Al Hadd. It was about 250km and we had a few stops to make along the way. 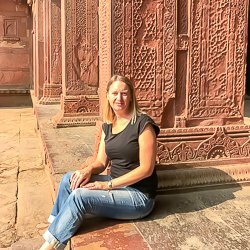 Our first stop was at the town of Quriyat where we stretched our legs and ended up taking a wander through the fort in the town. Entry was only 0.5OMR ($1.70AUD/$1.30USD) each and we were personally escorted through the small fort. As we walked back to the car, we were surprised to see a herd of goats make their way through the small park next to the fort. While not a huge city, this was definitely a decent sized town, and these goats did not have anyone with them, they were just happily roaming. Quriyat was the first place I started to feel uncomforable as a western woman. I was conservatively dressed with shoulders and knees covered but I started to feel all eyes on me. I had been given the heads up on this beforehand, so was also conciously wearing my blonde hair tied back to make it less obvious. As our visit continued in Oman, I felt like this almost every time I was in public in non-touristy places, particularly in the smaller towns. It was very rare to even see a woman on the streets, and if we did glimpse one, she was always fully covered with only her eyes visible. It was interesting because I had been in other places like this (for example Aqaba, Jordan) but did not feel at all uncomfortable there. The next stop for the day was the Bimmah Sinkhole. I had read mixed reviews about this place, but since it was right next to the road, we had time, and it was free, there was no reason not to stop. There isn’t a lot here except a great big hole in the ground. At the bottom is some brilliantly coloured water perfect for a dip. We didn’t swim, but I did sit with my feet in the water for a while once I discovered that this was a natural fish spa! I have tested out fish spas before. Basically you stick your feet in the water and these little fish come along and nibble off the dead skin and your feet feel nicer afterwards. When you first put your feet in the fish tickle like crazy, but eventually the sensation dims and there is no longer the urge to pull your feet from the water. 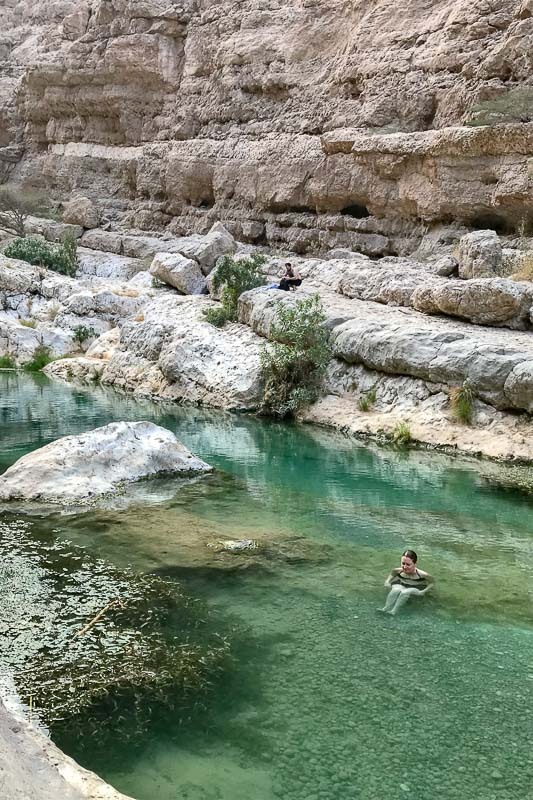 I could have sat there all day, but it was on to our next stop, Wadi Shab. 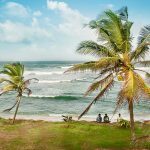 For most of the way the road followed very closely along the seafront and we were able to enjoy to stunning views. At Wadi Shab we had to hike for about 45 minutes to reach a nice waterhole. But first we needed to be ferried across the waterway by a local, which we had to pay the extortionate price of 5OMR ($16.70AUD/$13USD) for the return journey. It would be lucky to be 50 metres in total, and the locals can charge whatever they want – we actually heard one guy saying that he would charge more because the person complained about the price. Basically, you either pay whatever they say or don’t go! In the boat I realised I had forgotten to put proper shoes on – I just had my flip flops. I do not recommend doing this walk with just flip flops, as it is along a riverbed, so is rocky and slippery. I made it just fine, but it could have been so much easier. Once there we were hot and sweaty so the water immediately called to us. 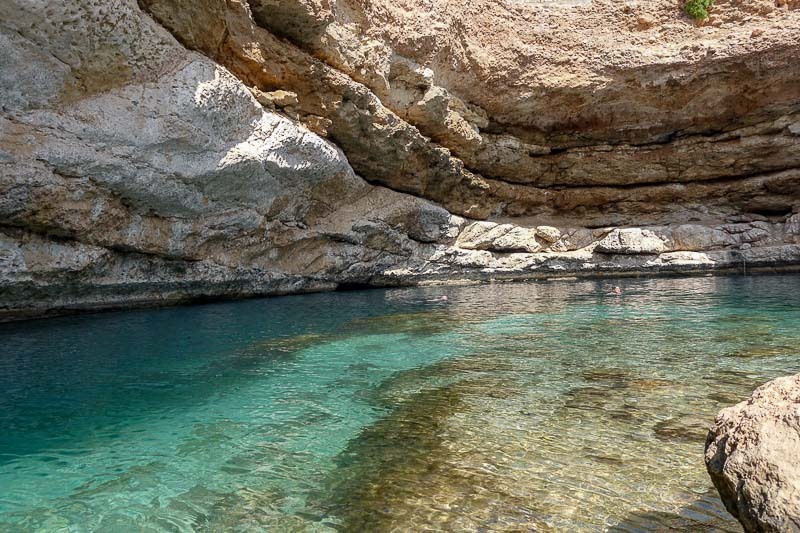 It is possible to swim along the wadi for a little way and swim through a crack in the rocks to a hidden cave with a waterfall inside. I’m not normally one for spending much time in the water, but this place was lovely. 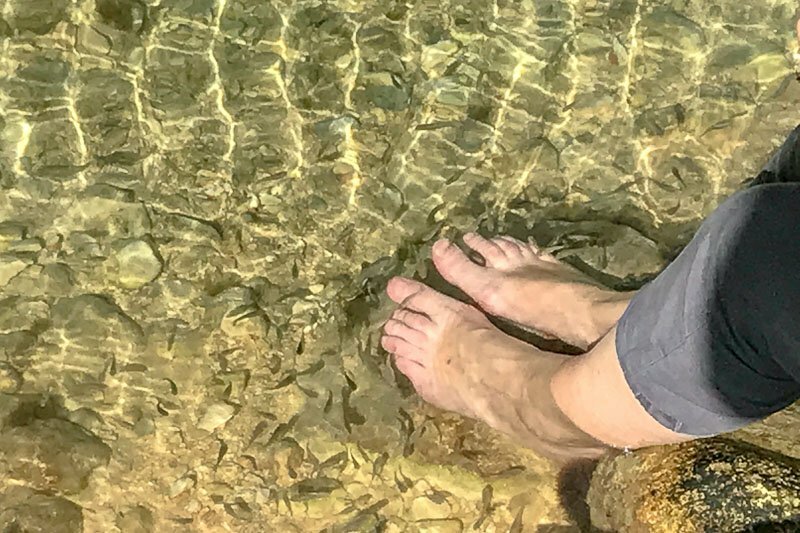 Even when Simon was out drying off on the rocks, I was still sitting in the water enjoying the fish again nibbling on my feet. Strangely they did not touch any other part of me. There was just enough time to put our luggage in our room and freshen up a little before we were off again, making our way to Raz al Jinz Turtle Reserve for some turtle watching. 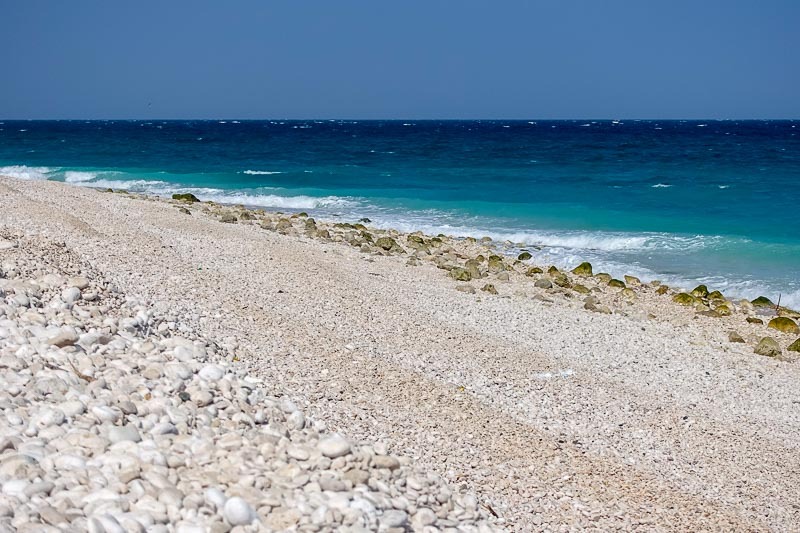 The beaches here are the nesting grounds for green sea turtles, and the turtle reserve runs a limited number of walks either early morning or at night to hopefully catch the turtles laying their eggs. Ironically peak season for the turtles is right in the middle of summer when visitor numbers are low due to the intense heat. Since mid November was lovely weather-wise, we were warned in advance that we may not see turtles. Our group was gathered together and we had to wait for the call letting us know that a turtle had been spotted on the beach. Within about fifteen minutes that call came and we started the walk down there. For the first section we could use torches and phone lights to see, but once we got closer to the beach only the guide used his torch when absolutely required. This made the walk slightly treacherous as the beach was covered in huge holes where turtles had nested in the past, or at least dug a hole to decide if they were going to lay there. We walked slowly, quietly, in a single file towards to turtle’s location. Unfortunately the turtle decided that the conditions weren’t right and rather than lay eggs we saw her make her way back into the ocean. One of the assistants was scouting further down the beach, and while we waited to hear if there was another turtle our guide talked about the plight of the green sea turtle. It wasn’t long before some of our group noticed a few baby turtles that had just hatched making their way down to the beach. Normally when turtles hatch it is the luminescence of the plankton in the water that draws them in the right direction. Since people have been building near beaches, the baby turtles will often get confused by those house lights and head the wrong way. (We later found some going the wrong way.) Our guide used his torch to help guide them towards the water. With all the lights off again, and after the discussion of luminescence, we started to notice it all around us. The beach literally sparkled, and the waves coming in to shore we filled with little dots of light. I was absolutely fascinated. I wonder if this happens on all beaches if you are looking with the lights out right near the water line? I will have to check one night when I am home. 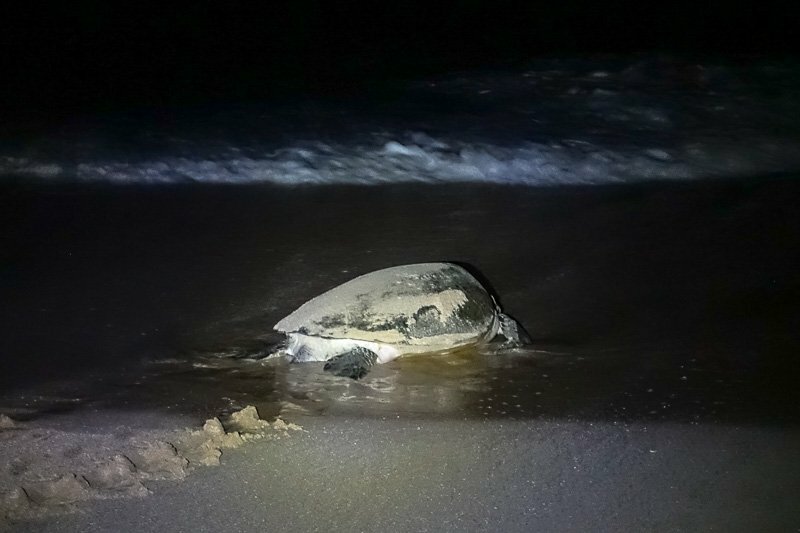 While we were a little disappointed to not see a turtle laying, it was enough to see the baby turtles making their way into the sea and the sparkling plankton. We have actually seen green seen turtles laying eggs before on the Perhentian Islands in Malaysia. (You can read a little about that here.) It really is amazing seeing how big these animals are and the care they take with their eggs. We were up early again the next morning for another long day of driving. We decided to take the long way, sticking to the coast. Some of the views of the coast were stunning, There were many small. nameless fishing villages with just a few low buildings and boats along the shore. Ocasionally we ventured further inland, and were met with drifting sand dunes. Nothing but red sand as far as the eye could see. Some sections were completely void of any vegetation, any sign of life at all in fact. 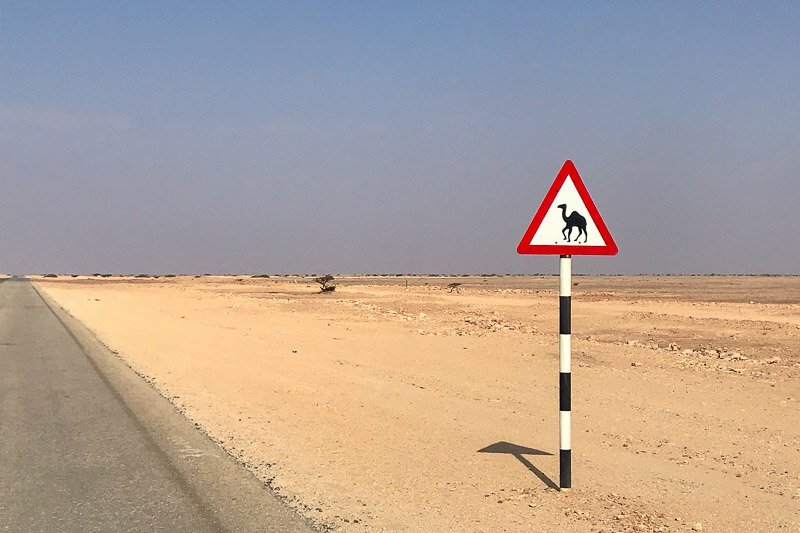 At least there is no vegetation or corners to obscure the camels! We ended the day at Duqm. About twenty kilometres out from the town we started to see major road works, bridges and all sorts of other infrastructure being built. There are buildings going up, and signs told us a new port was opening. There are zones set up that will eventually be dedicated to tourism, living and industry. 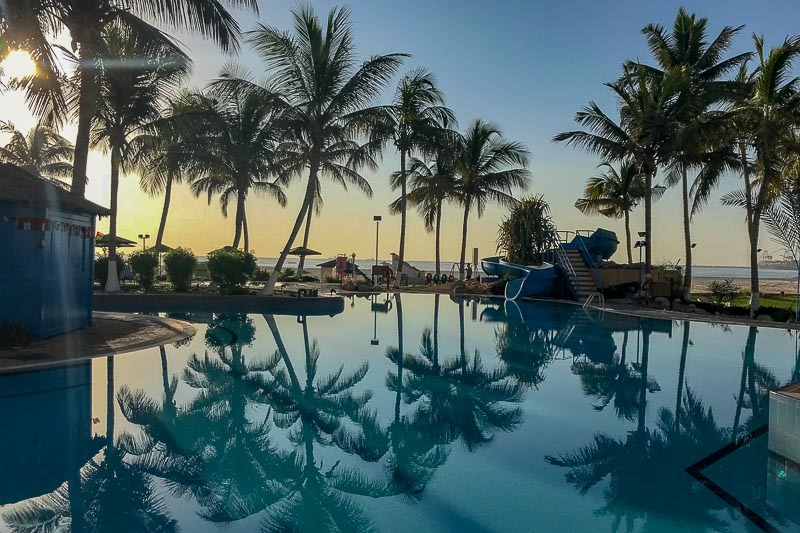 We stayed in a fancy Crown Plaza, which apart from the Radisson Blue hotel next door, was all alone in a beach resort area. 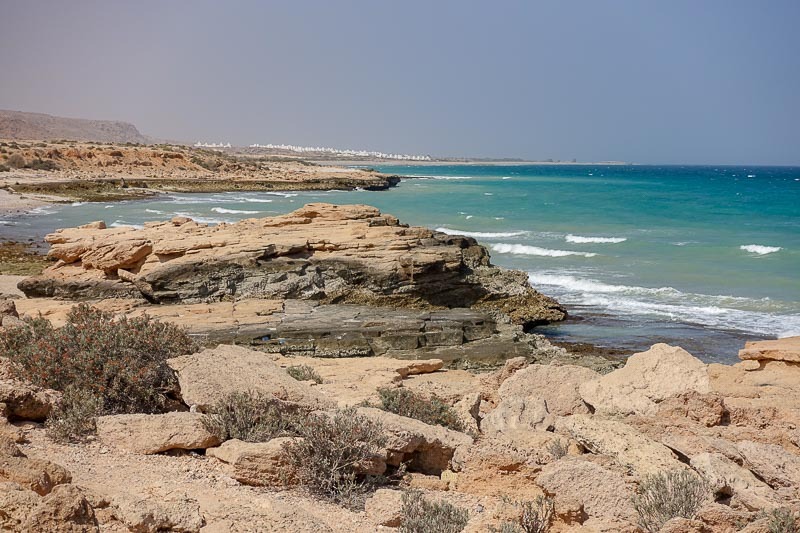 I was intrigued by all this obvious developement in the middle of nowhere, and a quick google search informed me that it is being driven by Chinese investors who are building a huge new industrial city in this remote corner of Oman. We had one more day of driving to reach our final destination, Salalah. This was more flat desert roads with not a whole lot to see until about 75km before Salalah when we drove through some hills and out the other side to see a green fertile area. On this side of the small range there is a completely different climate, with the sumer months of June to September bringing monsoon rains leaving the area green. There are areas here where in those summer months waterfalls flow and it’s perfect for hiking. We were a little late for that unfortunately. 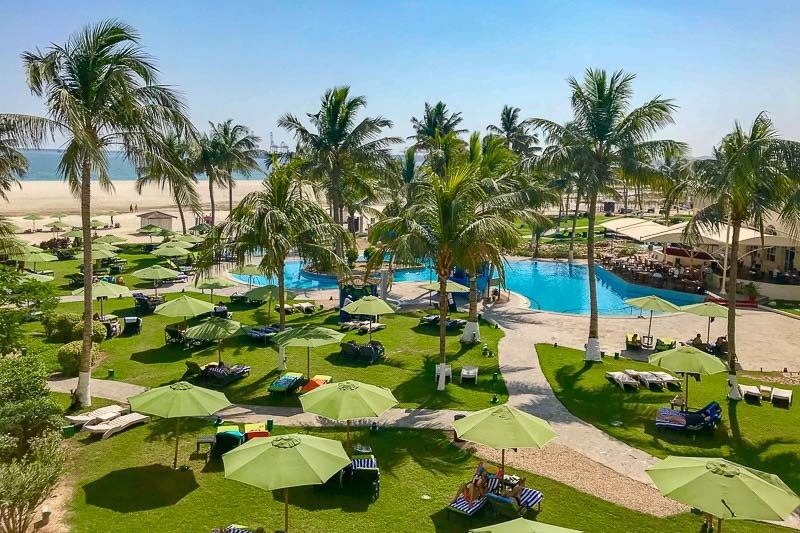 In Salalah we used some of our Hilton points to stay at the Hilton Resort. After all our driving we mostly spent the three days we were here relaxing around the pool. We ventured into town a few times for food, but that was about it. We found an absolutely delicious local Indian restaurant called Topaz that was so cheap and the serves were huge. We almost went back there again the next night but thought we should give some other places a go. Soon it was time for us to leave our little oasis and make our way back to Muscat for our flight out. We had two days to get back and had decided to drive on the main highway through the middle of the country. It was a touch under 1100km. We looked over the map again and again, trying to decide where to stop for the night. We thought we had made up our minds then changed them again a few times, before finally deciding to just drive and we would see how far we would get. 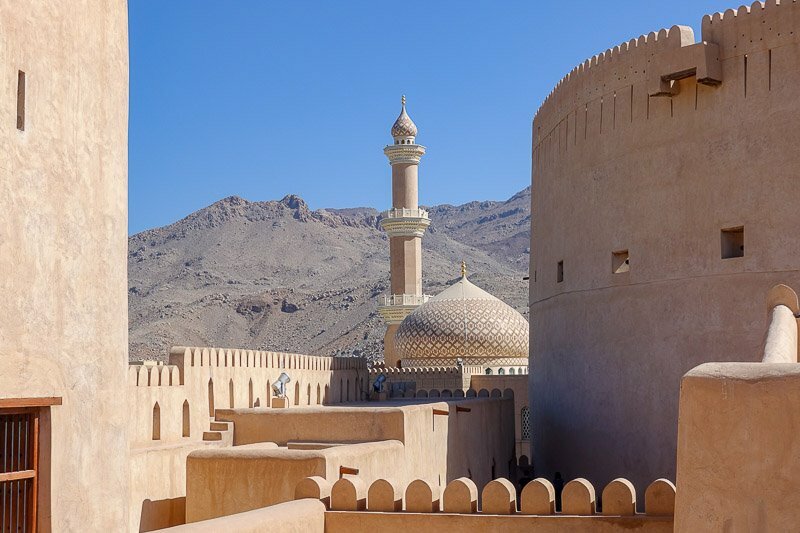 I set Nizwa as a goal, because there were things I wanted to see the next morning if it worked out. That meant almost 900km in one day. In the end that’s what we did. We drove into Nizwa just as the sun was setting. I had booked our accomodation on line only half an hour before. In Oman the roads are good, there is little traffic and there is a speed limit out on the highways of 120km/hour. We stopped only for fuel and some quick snacks. Really the drive didn’t seem as long as it was, and it was nice to know we didn’t have far to go the next day. In the morning we visited the Nizwa Fort. This has been recently restored and turned into a museum for the area. There are some nice displays and it is worth popping in here for and hour or so to have a look. 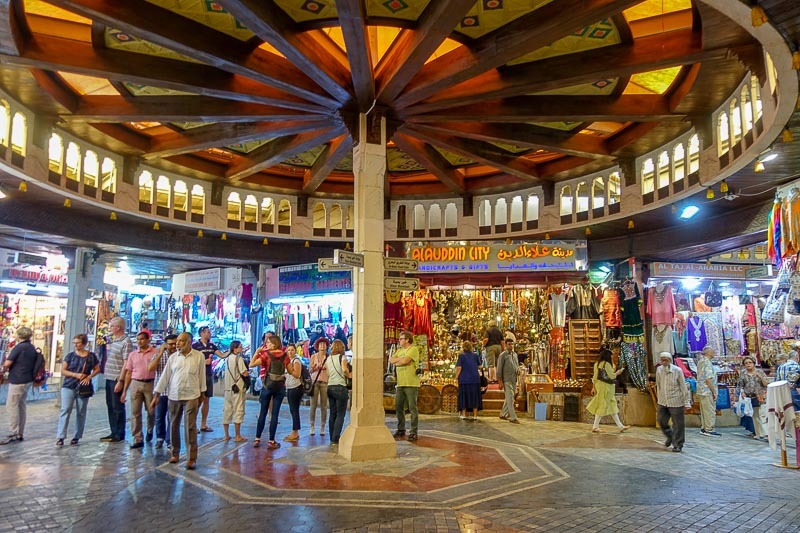 We poked around the neighbouring souq for a while before deciding to move on. It was barely midday, and we had about a two hour drive to go, but our flight wasn’t until 10pm. 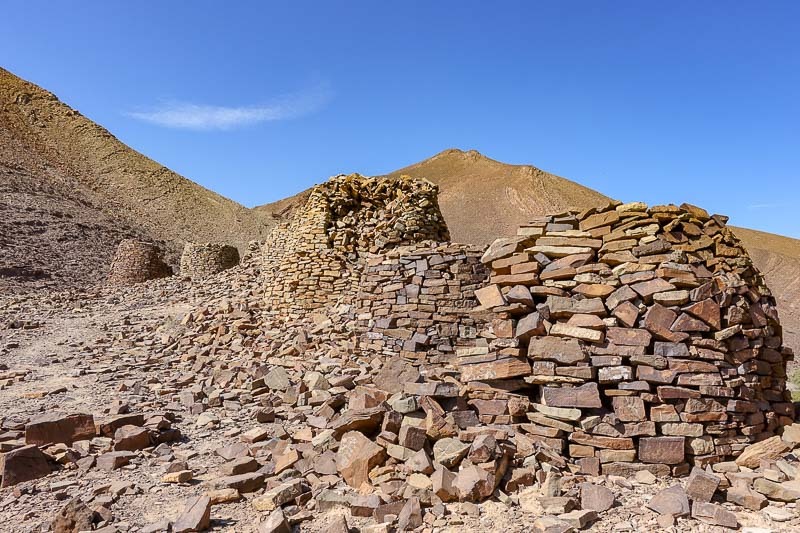 I had seen mention of the Al Ayn beehive tombs in the museum, and remembered coming across them when reading about Oman. They were 100km in the wrong direction, and we would then have to double back through Nizwa to get to Muscat, but we still had plenty of time so off we went. We still ended up arriving at the airport with hours to spare but were happy to hand over the keys to the car and relax in the lounge before finally saying goodbye to Oman. I’m still not exactly sure how I feel about Oman. As I said earlier, I often felt uncomfortable (maybe self-conscious is a better term) in public which I think clouded the whole experience for me a little. I want to say it was a challenging country to travel in, but then I struggle to come up with a single example to back up that statement. There was nothing though I really disliked about our visit. 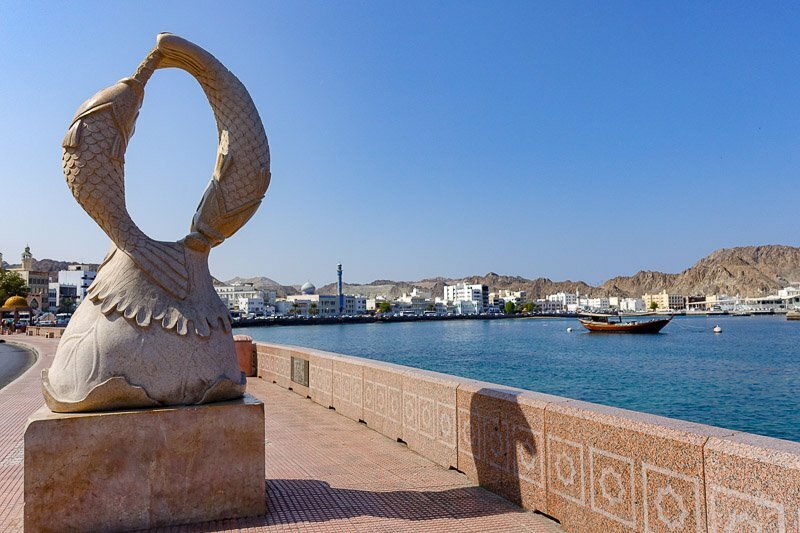 Perhaps it was just that we didn’t interact alot with Omani people to get to know them a bit better so I don’t feel I connected with the country as much as I have in some others. Would I go back? Well, I don’t feel any desire to go back, but if a reason for me to do so arose, I would love to go back and give it another chance. Right now I think without a solid reason, there are so many other places I would rather go instead. Wifi was mostly terrible throughout the whole country. In many places while driving there was not even any reception for my phone and data. Almost every place we stayed at had wifi, but it was slow and often disconnected. I would have a hard time in saying any internet in Oman was reliable. 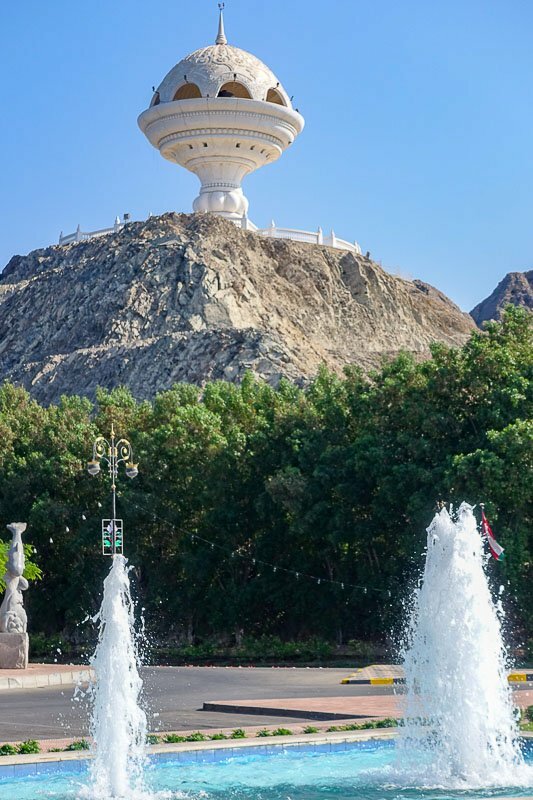 We found Oman to be quite an expensive country to travel in. The only thing I can think of that seemed cheap was the cost of fuel for the car. 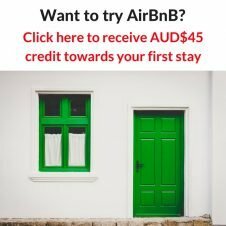 We found both food and accommodation to be expensive compared to other similar countries. Pricing was hard because taxes and service charges were sometimes added on top of what was shown so was often a surprise. This included some of the accommodation. There was no mention of the taxes until we arrived. Liked this post? Share it with friends and pin for later. Thanks Rob. I only felt uncomfortable in the small towns and less touristy areas. It’s the first time I’ve felt like I should stay in the car while hubby went into shops etc. 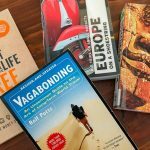 We went to India after Oman, and I also received attention there – look out for my next post! Enjoyed reading this one! 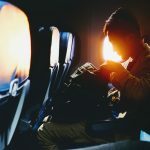 Travel to a less than well-known destination. I’m turning into a little bit of a mosque junkie, because their decorations and architecture are often so elegant. Each one with, as you note, a little local influence. 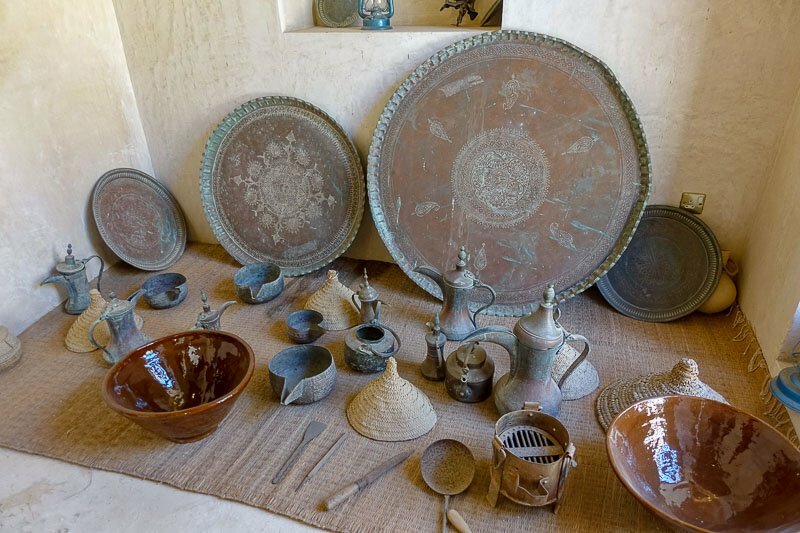 Our guide in Iran pointed out Zoroastrian features of current mosques, and this is centuries after the Arabic invasion! Speaking of Iran, your photo of Quriyat Fort and the goats reminded me strongly of Shiraz and the fort there. Goats roam freely around – though usually not in city centres, and usually with a goatherd – but the goats themselves look like siblings to yours. Thanks Pete. 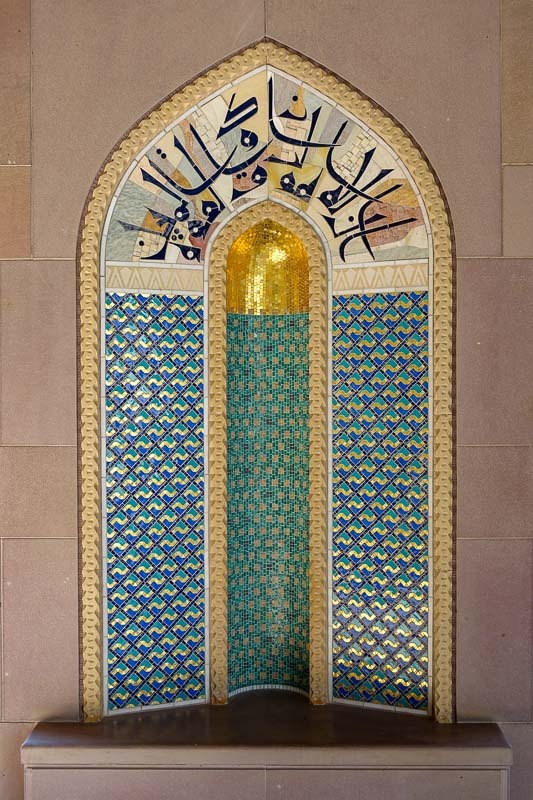 Yes, I am a sucker for a good mosque. So hoping I can still make Iran happen. I need to find time to do some serious research. Makes it so much harder knowing we can’t just wing it!